Canal Street Art Gallery presents: CORINNE GREENHALGH - Recent Oil Paintings and MARCIE MAYNARD - Oils, Pastels & Monotypes in the gallery’s first ART DUO SHOW opening January 16th, and on view to the public through February 9th. All are invited to attend the opening reception with the artists, on Bellow Falls 3rd Friday Gallery NIGHT, January 18th from 5-8pm. The Gallery is located at 23 Canal Street in the Historic Downtown Village of Bellows Falls, Vermont, and is open Wednesday through Saturday from 11:00am to 5:00pm. CORINNE GREENHALGH & MARCIE MAYNARD is the second exhibition featuring artists represented by the gallery, and is the first to highlight two artists in simultaneous, side by side solo shows. Also significant to this show, is the recognition of the 20th Anniversary of R.A.M.P. (Rockingham Arts and Museum Project). In 2000, R.A.M.P. completed restoration of the Exner Block on Canal Street in Bellows Falls, where Canal Street Art Gallery opened its doors in 2017. Now, nearly twenty years since restoration, the gallery is pleased to exhibit artworks by Corinne Greenhalgh and Marcie Maynard, two of the first artists to rent storefronts and open studio spaces in the Exner Block. Greenhalgh, born in Miami, Florida and arriving in Bellows Falls in 2001 from San Diego, California, still occupies a studio space in the building, alongside her Tailor shop at 17 Canal. Maynard, born in Queens, New York, moved to New Hampshire in 1976, and opened Three Rivers Gallery in The Exner Block in 2000. Maynard has since relocated to her current studio and showroom, Cold River Furniture, located at 33 Westminster Street on the Square in Bellows Falls. With the support of both R.A.M.P. and Canal Street Art Gallery, these artists continue to make original high quality artwork available while the Exner Block’s mission of affordable gallery storefronts, subsidised studio spaces, and housing for artists is realized. Corinne Greenhalgh shows recent paintings from her prolific body of work. 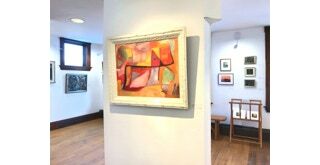 Working in oils, Greenhalgh pursues compositions using strong geometry with defined boundaries, broken by gestural patterns of less, if at all, defined shapes. The geometric shapes often focus on bright, but never quite primary colors, and are intersected with patterns and textures of subtly graduated warm and cool values. Greenhalgh’s paintings achieve a precarious balance with the use of geometry, color, brushstroke, and pattern. The artist finds this balance through careful consideration, knowledge, and an unyielding talent to create solely for the sake of creating. 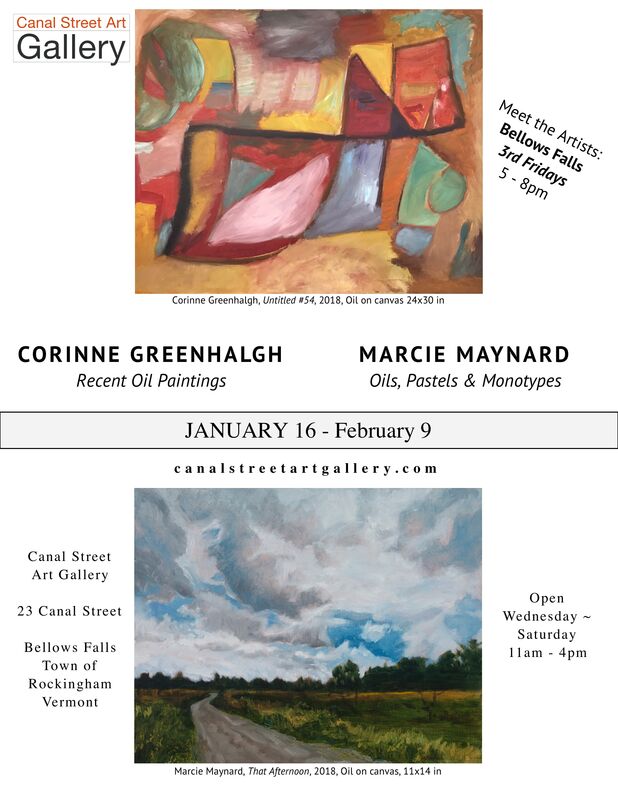 Marcie Maynard presents oils, pastels and monotypes. This collection is a journey through the artist’s observed, envisioned, and abstracted landscape series. It is presented as a retrospective from two decades of Maynard’s work. The artist’s observational landscapes in pastel, use compositions which lead the eye of the viewer to focal points of horizons, cloud formations, rivers, floodplains, mountains, and forests. These subject matters of wild landscapes with intimate details, show the artist’s vision of the surroundings which inspire her and invite the viewer to find a sense of place in her work. Maynard’s landscape paintings in oil have, over her career, given way to more and more abstraction. Many of her recent works in this show use color palettes of bright primaries along with rich, deep pigments. These paintings are more about the colors and shapes of the landscape, then the landscape itself. Maynard’s monotype prints show the artist’s observation of the textures in the landscape, revealing abstraction through a more tonal color palette. Using this range of mediums, Maynard’s body of work shows the sojourns and meanderings of an artist in pursuit of a personal expression of our shared experience in the landscape.